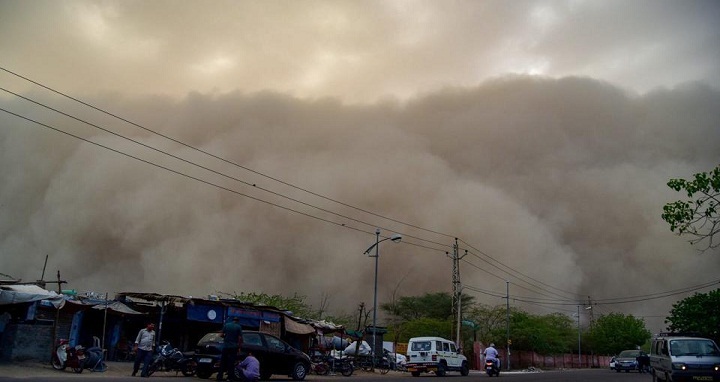 Dhaka, 14 May, Abnews: At least 70 people have been killed and over 100 injured after a fresh wave of violent sandstorms and thunderstorms battered India, officials said Monday. Winds of over 100 kilometres per hour struck parts of north, east and southern India late Sunday, uprooting trees, electricity pylons and damaging houses, officials from federal and state disaster management agencies said. Forty people were killed by hail and thunderstorms that brought down walls, trees and power pylons in Uttar Pradesh state, TP Gupta of the state disaster management department told AFP. Another 80 were injured by the winds that flattened nearly 40 houses across India's most populous state. Another 14 people were killed Sunday by thunderstorms in West Bengal and 12 by lightning bolts in Andhra Pradesh. The southern state had also been hit by more than 40,000 lightning bolts on 1 May killing 14 people in a matter of hours. The latest storms also killed two people each in Bihar and the capital New Delhi where winds reached more than 100 kilometres an hour, national disaster management authorities said. Indira Gandhi International Airport was closed for more than two hours because of the winds, with 70 flights diverted. The deaths came just 10 days after a sandstorm left more than 84 dead, most of them in Agra -- the city of the Taj Mahal. India has been gripped by a freak weather system since the beginning of May, with many parts of the country experiencing extreme conditions. Weather forecasters warned of fierce storms in parts of the north and east for the next two days. Similar storms hit the region every year but this year has been the deadliest. On Thursday a thunderstorm left at least 22 people dead across India.